Costa Rica’s IPRI score increased by 0.511 to 6.571 placing it 2nd in the Latin America and Caribbean region and 31st in the world. Costa Rica is classified by the IMF as part of the Latin America and the Caribbean group and by the World Bank as Upper middle income country. Costa Rica’s Legal and Political Subindex increased by 0.170 to 6.568 with scores of 7.255 in Judicial Independence, 5.927 in Rule of Law, 6.685 in Political Stability, and 6.404 in Control of Corruption. Costa Rica’s Physical Property Rights Subindex increased by 0.298 to 6.697 with scores of 6.302 in perception of Property Rights Protection, 9.625 in Registering Property, and 4.164 in Ease of Access to Loans. 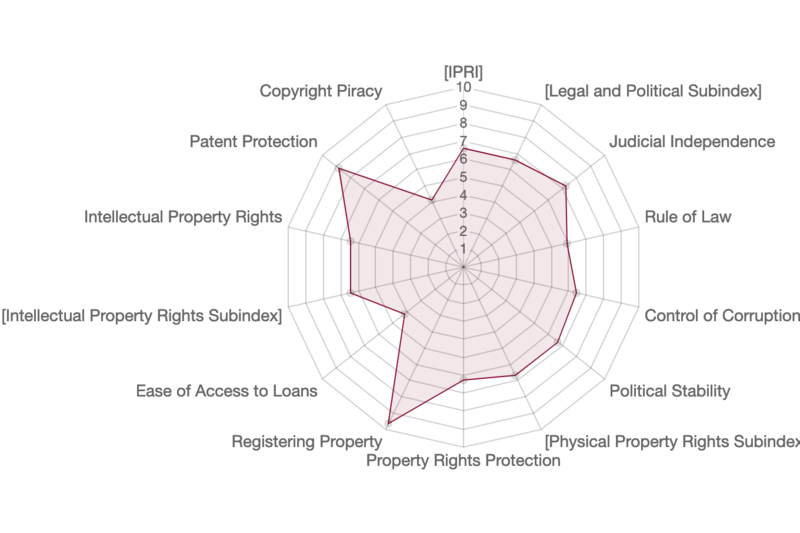 Costa Rica’s Intellectual Property Rights Subindex increased by 1.065 to 6.448 with scores of 6.412 in perception of Intellectual Property Protection, 8.833 in Patent Protection, and 4.1 in Copyright Protection.